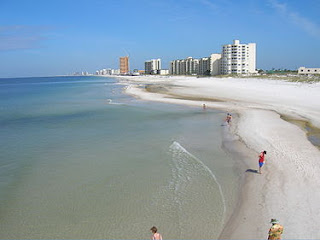 Panama City Beach on the Florida panhandle is a gulf coast vacation destination in northwestern Florida. It's known for miles of sandy beaches fronting the Gulf of Mexico and raucous spring-break parties. Popular theme parks include Gulf World Marine Park, offering swimming with dolphin experiences, and Shipwreck Island Waterpark, featuring water-slides and more. St. Andrews State Park is one of 2 protected nature preserves nearby more details - visitor information.